Preheat the oven to 350°F. Prepare three 8-inch round baking pans, line the bottom with parchment paper. Grease and flour the sides. Prepare your bake even stripes if desired. In a large mixing bowl, combine the sugar, vegetable oil, eggs and vanilla extract. Beat on medium speed until the eggs and oil are well incorporated and the batter is lighter in color. Next mix in the sour cream and beat until well combined. Alternate half the dry ingredients followed by half of the coffee and mix just until the flour starts to incorporate. Bake at 350°F for 20-24 minutes. Rotate your pans in the oven halfway through baking. Prepare the espresso. In a microwave-safe dish, heat the water until it’s almost boiling and add 1 tablespoon instant espresso powder, stirring until it’s dissolved. Place the espresso in the freezer to cool it down. 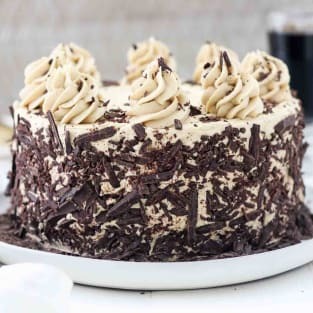 Once cooled, measure out 2 tablespoons of brewed espresso to add to the frosting and brush any leftovers over top of the chocolate cake layers prior to assembling. Cut the butter into pieces. Using the paddle attachment, whip butter for 3-4 minutes, scraping down the bowl occasionally. Beat until butter looks light in color. Alternate adding 2-3 cups of powdered sugar at a time with a portion of the liquid ingredients: brewed espresso, heavy cream and vanilla extract. Ensure all the powdered sugar is well combined and beat for 2-3 minutes before adding additional powdered sugar. Add the remaining 1 1/2 tablespoons espresso powder into the prepared frosting. Level off your cakes by removing any domes. Place a dollop of frosting on your cake board and place the bottom layer of cake over that. Pipe the first layer of frosting, pipe in circles working outside edge to the middle. Spread evenly with an offset spatula. Add the second layer of cake and add the remaining frosting. Place the third layer of cake on top. Use you offset spatula to press any excess frosting onto the edges of the cake. To finish, pipe the frosting along the outside edge of the cake using a large open round tip, or a cake icer tip. Then use an offset spatula or icing smoother to create a smooth edge. Chop the dark chocolate into thin and small pieces and gently press into the sides of the cake. Fill the piping bag with the remaining frosting to pipe the rosettes on top. Sprinkle to top with leftover chocolate. Store in an airtight container. I recommend this espresso powder.